There has been a casualty at our place. A lovely, fine, cotton fitted sheet. It wore through into holes! This is my favourite set of sheets, sadly. 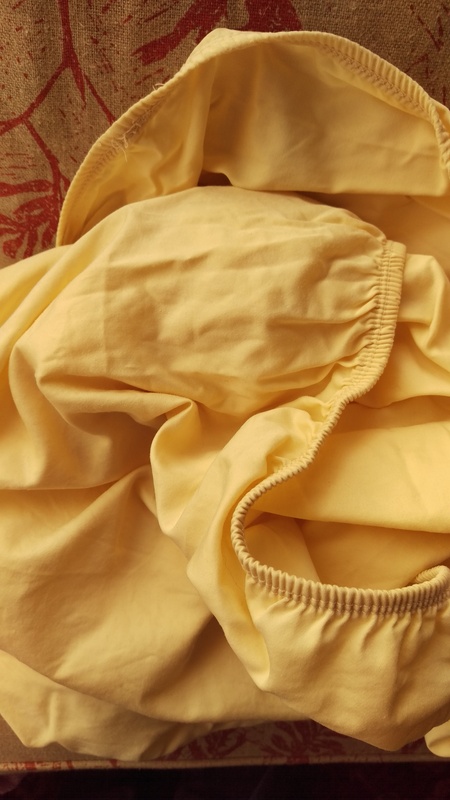 A lovely buttery yellow and a beautiful fabric, bought for a remarkably low price when orphaned in a shop. I didn’t want to relegate it to a dropsheet (something that protects the floor when you are painting). 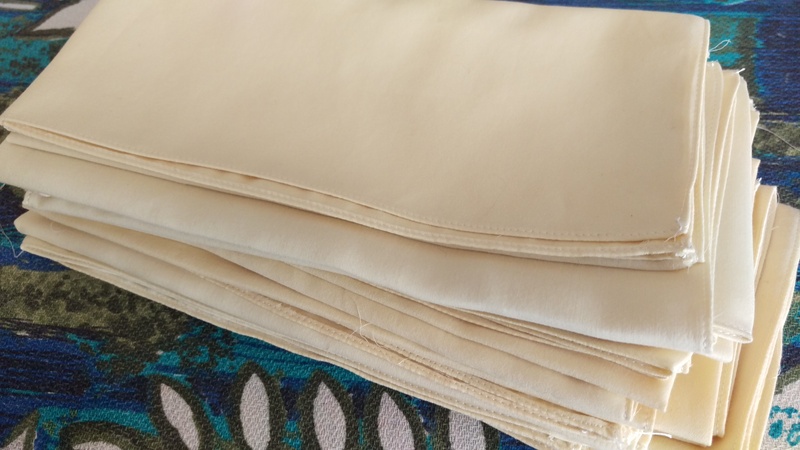 So, now that I have made friends with my roll hemming foot, I decided to practice, and made 45 cm square napkins and handkerchieves. They look good. Not perfect, but good! Several made it into a bucket of milk and then a dye pot. They are not quite what I had hoped for, but they are fine. Clearly this cotton was harder to wet than some, and the milk mordant streaked along the lines where they fell into folds as they hung to dry. That has left some really interesting patterns on the fabric. I am wondering whether to leave the remainder plain or action my original idea–an indigo dye pot in the heat of summer and some shibori style stitch resist decoration. At the moment that feels like more than I can manage. In the meantime, I found some fine vintage looking lawn from an op shop in the cupboard during a recent (cough!) spate of bag making and decided it was not appropriate for a bag but was perfect for more handkerchieves. Evidently I am on the verge of becoming an evangelist of the hanky. Brace yourselves! Oh, that’s laugh out loud! Thanks, Lee! I have an antique Kenwood Chef that has seen a lot of mileage, having once belonged to my grandma. Oh, the tangles I can see coming if I tried this! I have never taken up tissues either but–I may be becoming a hanky advocate and not just a user of the humble hanky! The roll hemmer foot came with the machine, or I would never have attempted it! You make me look at old used worn torn natural textiles with new eyes. I cringe at the beautiful old cotton sheets I’ve set to the garage for rags. I shall never do that again. I have just come back from an artist in residency in Morocco and made a few vats of natural indigo using stewed bananas and dates. You’re probably a master at this, but it’s so easy and quick and the vat is so deliciously ‘fertile’, you should definitely action your original idea of indigo and Shibori. I would love to see your results. It might just be a fluke with my vats but I always do a little offering and prayer beforehand, talk to the vat constantly and treat it with the utmost respect and reverence. Apparently being past child bearing age also is an asset. I love the unscientificness of it..the smell of something so magic and earthy and of course the complexity of colour and of course the arbitrariness of something that is ancient and of the earth. I’m hooked.